Press CTRL + D to add the file called frmGetNames.vb from the above folder into your project (or right click on the project and choose to add it as an existing item). 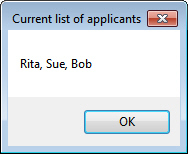 After typing a name into the box, a user should be able to click on the button to add the name to an array. Don't forget to add a check that you haven't exceeded the maximum allowed number of applicants (as set in the maxNumber constant). 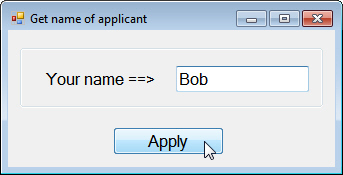 Keep adding names to check that you can't exceed the maximum number given in maxNumber, then close your application and forms down.